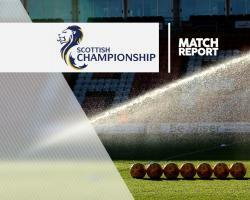 Ross Forbes' second-half strike proved enough as Morton edged a narrow 1-0 victory over Queen of the South in an evening Championship kick-off at Cappielow Park. The hosts managed to dominate possession and had the better of the chances but were unable to break the deadlock in the opening 45 minutes despite Andy Murdoch firing narrowly wide after 22 minutes and a disallowed effort from Celtic loanee Jamie Lindsay on the half-hour. But 10 minutes after the break Forbes weaved inside from the right flank and found the top-left corner with precision strike from a tight angle for his 12th goal of the season. Motherwell loanee Dom Thomas came closest to claiming an equaliser for the visitors on the hour but his effort was blocked as the Ton held on to move above Dundee United into third, with their opponents 10 points further back in fifth.